Board games and Liz go together well. She has loved them since childhood, and still owns many of the old classics. She also likes PC games. 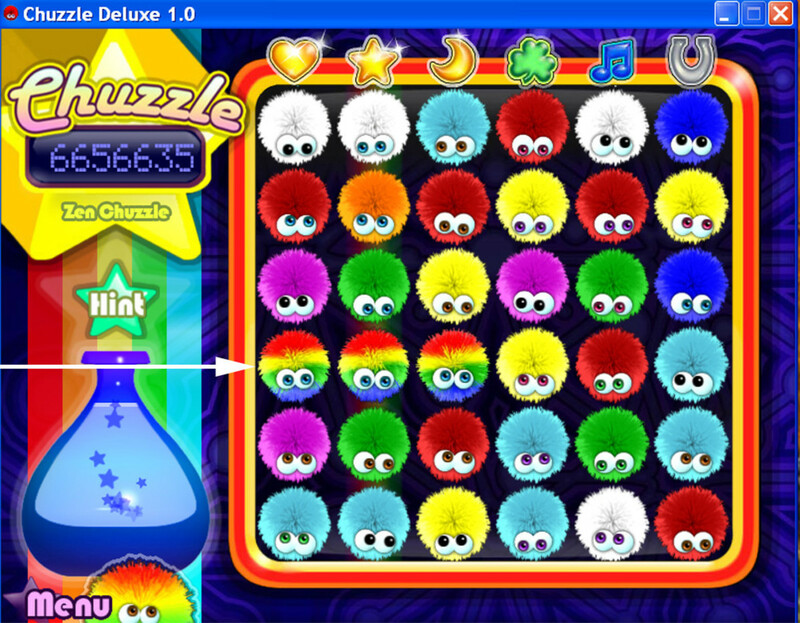 Chuzzle by Pop Cap® games, is another in the ‘match-3-or-more-colors’ genre. It has its own spin on the theme however. 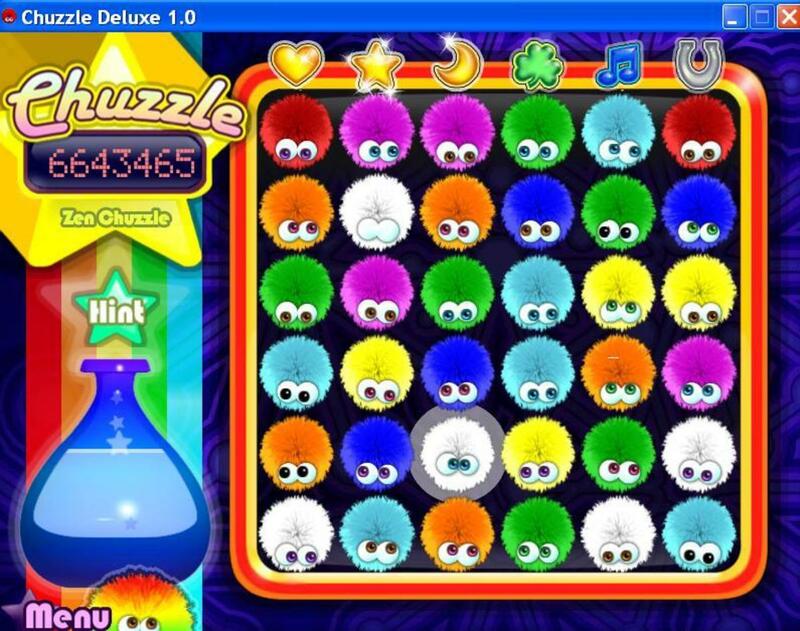 Instead of swapping places with gems or balls, you slide entire rows of fuzzy, furry little "Chuzzles." As you mouse over them, they roll their eyes to look around, almost as if in fear of being chosen. When a valid match is made, the group highlights, and they shudder in fright! Who can blame them, after all, when a match sends them packing off to a laboratory beaker! What is interesting to note about Chuzzle is that as you slide the rows, you soon discover that they are riding on an endless loop, much like a belt. As you drag a row up, watch, as the first color at the top now becomes the first one at the bottom. The same is true of sideways moves. 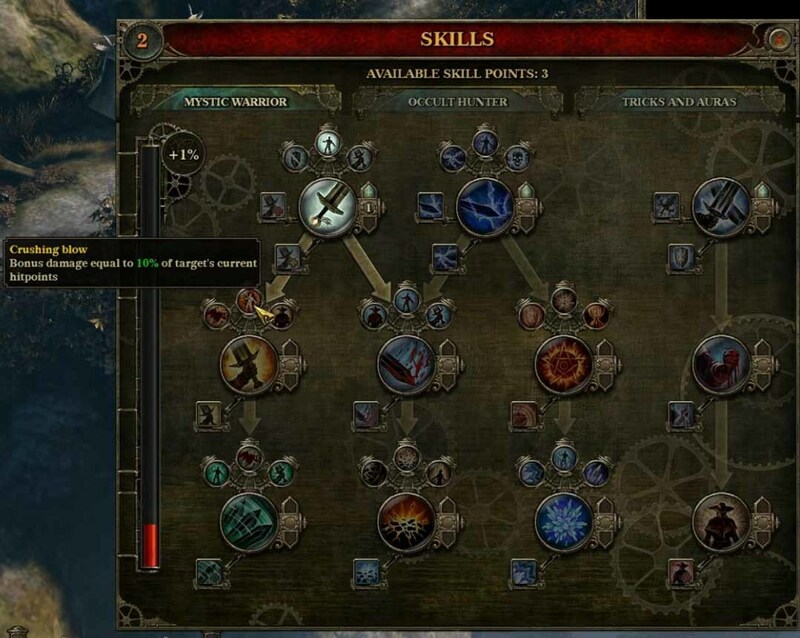 This feature can play into the strategy of the game. Sometimes it will work to your advantage to bring in the match from the top; sometimes from the bottom, or from right or left. Like chess or checkers, the move is not complete until you let go of the piece, or in this case, the mouse button. Therefore, you are free to experiment with various moves, doing a ‘trial placement’ of the row you are moving until you find the one that will dispatch the maximum number of the little Chuzzles. Some of these games, such as Chainz, about which I also wrote, have ‘wild card’ colors. Unlike Chainz, however, the rainbow-colored Chuzzles are not wild cards; they are a color unto themselves and must be matched with other rainbow Chuzzles. They are much more rare, and score proportionately higher points. Similar to Bejeweled and other matching games of this type, it is possible to make a match in 2 directions at once: horizontally and vertically. This leads to bigger and better chain reactions, so make such matches whenever you can. 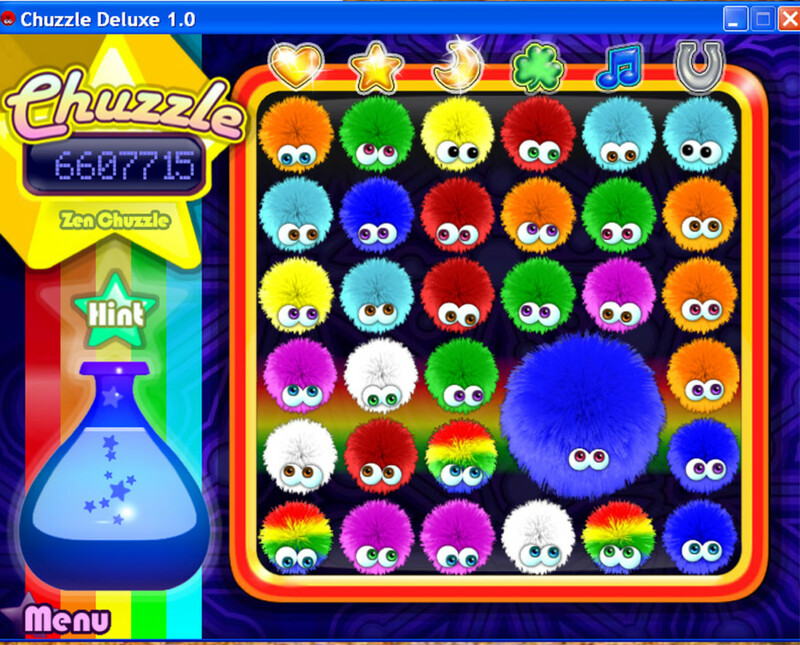 One of the features making Chuzzle different from many of the other games of this type is the random appearance of extra-large Chuzzles. These guys take up the width and height of 2 full rows, and when sliding the rows, the entire row next door follows along. 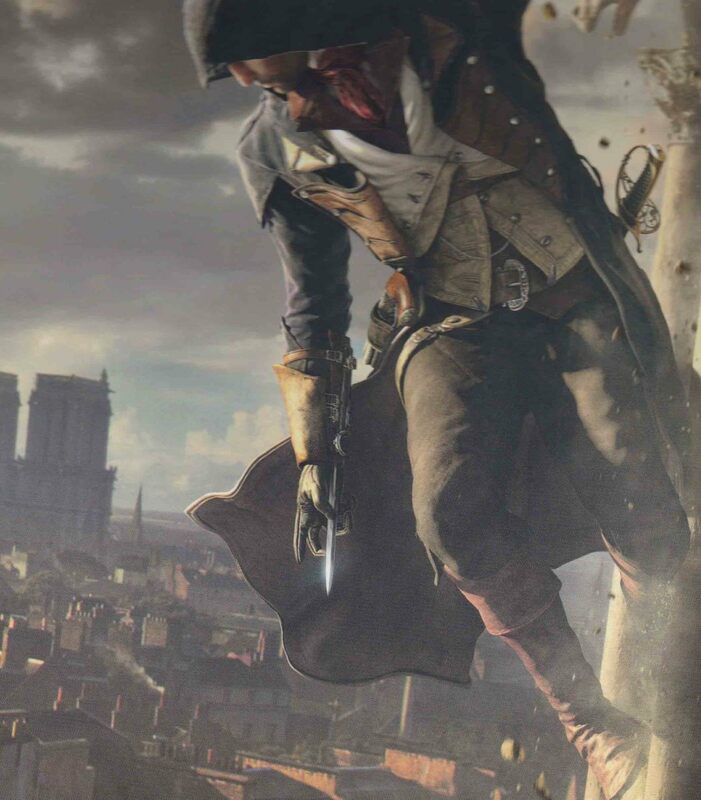 They are maddening, and the best strategy is to find a match to blow them out as quickly as possible. The other aggravating thing about these ‘super-Chuzzles’ is that they will not slide off the edge of the screen. They’re simply too large to fit through the doorway, and crash into the edge of the game screen with a petulant ‘ooooff!’ sound. There are a few helps along the way. Some Chuzzles turn into bombs. When matched up with others of their color, they blow out all surrounding Chuzzles regardless of color. Bombs can be spotted by an aura or halo glowing around the outside rim. In this illustration, the bomb is white, and located 3 in from left; 2nd up from bottom. If you have been lucky enough to make a 2-direction match with 5 or more Chuzzles, the resulting explosion can clear almost a quarter of the screen. That's good for some serious bonus points! Chuzzle has various play modes. Classic, which is the original un-timed game--take as long as you want or need to complete. Speed Chuzzle, which does have a time limit in place--make it through as many levels as possible before the timer runs down. Zen Chuzzle allows you to play and play and play and never lose, come up against a timer or run out of possible moves until you get totally bored. Mind-Bender Chuzzle, which presents a pattern which must be duplicated to clear the level. It is fiendishly challenging: I’ve never managed to complete even the first!! 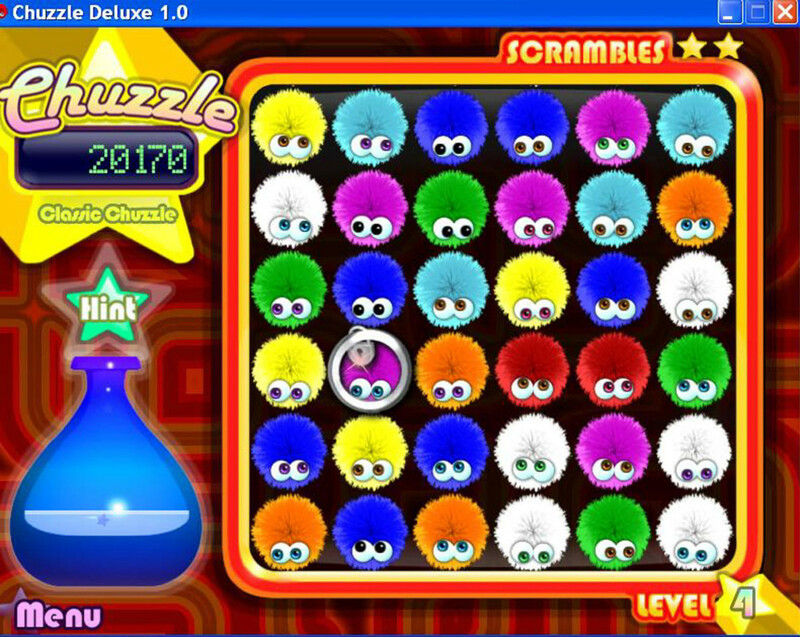 Both Classic and Speed Chuzzle offer 2 ‘scrambles’ available, which is this game’s equivalent of ‘extra lives.’ They cannot be chosen by the player—they are controlled behind the scenes, and appear when needed. Classic Chuzzle allows you to advance through harder and harder levels, until you run out of moves. How does this happen? Starting at level 3, there come into play padlocked rings which encircle a single Chuzzle and lock it from moving at all, either horizontally as a row, or vertically as a column. 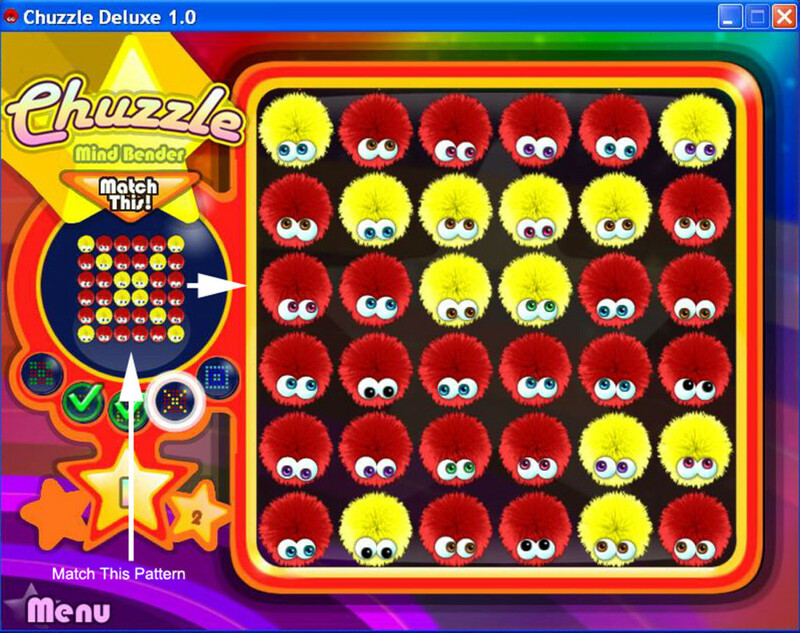 In order to clear the lock, you must manipulate surrounding rows (or columns) to create a match of at least 3 Chuzzles to include the padlocked one. As you advance, more and more padlocks will drop in, restricting your moves even further, until there is simply no place to move as the entire board becomes locked up. Please Don't Fence Me In! You are correct.. that was an error..what I meant to say was, "..manipulate surrounding rows to make a MATCH of 3 that includes the padlocked Chuzzle." Thanks for pointing that out. I'm fixing it right now. "In order to clear the lock, you must manipulate surrounding rows to match at least 3 other Chuzzles". This is incorrect. It at least 2 other Chuzzles. Further, you must manipulate rows OR columns. Thanks for stopping by..glad you liked it! Yeah, it's fun...and can get addictive .. LOL I think it's only a download..don't recall seeing it in the stores. There's a very similar one on Face Book called "Staries," using the same principles, but it uses stars instead of the fuzzy "Chuzzles," and the locks come in the form of push-pins anchoring things in place. Also, I don't think (can't recall) that it uses any over-sized bits. 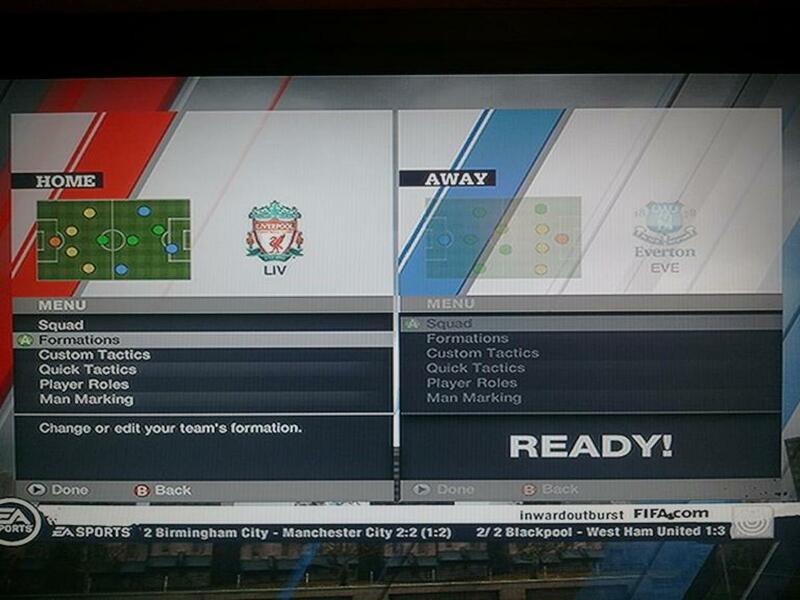 Nonetheless, it's a good place for free try-outs before deciding if you want to download/buy that or similar game.